Cashmere care. How to care for cashmere? 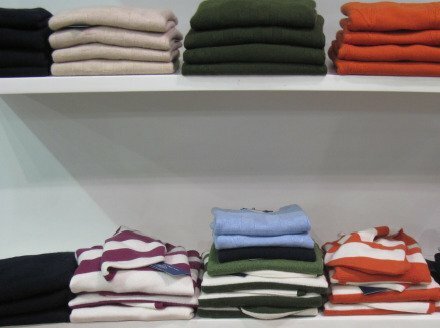 Cashmere garments can be dry cleaned or hand washed. Always read the washing instruction in your cashmere knitwear. Can you hand wash cashmere? How how to wash cashmere sweaters? First, remove small fluff balls or pills by hand or using a cashmere comb. You can purchase cashmere combs and cashmere wash on the internet easily. Pure cashmere collection has them for reasonable prices on cashmere sale. Wash your cashmere with the special cashmere wash in lukewarm water. After washing your garment, rinse it in lukewarm water till the washing liquid has been removed. Avoid using hot water. Hot water makes cashmere shrink! Squeeze gently and lay the cashmere flat. Do not tumble dry. Wash your cashmere kntwear separately. When they are dry, cool iron on a steam setting. How to clean a cashmere sweaters? How to remove a stain from a cashmere sweater? When something solid, such as bubble gum or candle wax gets stuck in your cashmere garment its best not to try and remove it yourself. You may damage it. Better let the specialists do their job. When you take cashmere knitwear to a dry cleaner always let them know exactly what it is you need removing. People often ask "My cashmere sweater has hole in the elbow. Can a cashmere sweater be repaired?" 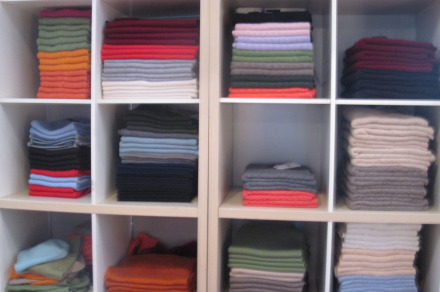 Some cashmere stores have a repair section. They can fix your cashmere sweater with elbow patches or stripes. The patches or stripes can be same or similar color as your cashmere sweater.